Kalgoorlie, now known as Kalgoorlie–Boulder after the towns of Kalgoorlie and Boulder joined, is a city in the Goldfields-Esperance region of Western Australia. 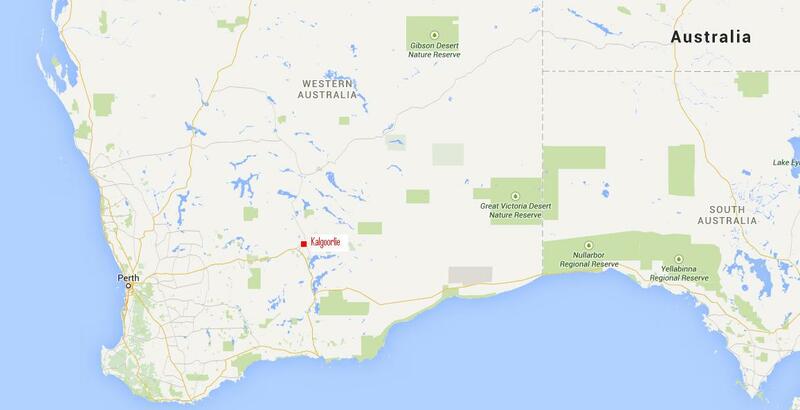 It is located 595 Kms (370 mi) east-northeast of Perth at the end of the Great Eastern Highway. The town was founded in 1893 during the Yilgarn-Goldfields gold rush, and is located close to the so-called “Golden Mile”. In January 1893, prospectors Patrick (Paddy) Hannan, Tom Flanagan, and Dan O’Shea (yes, they were all Irish) were travelling to Mount Youle when one of their horses cast a shoe. During the halt in their journey, the men noticed signs of gold in the area, and decided to stay and investigate. On 17 June 1893, Hannan filed a Reward Claim, leading to hundreds of men swarming to the area in search of gold and Kalgoorlie, originally called Hannan’s, was born. The mining of gold, along with other metals such as nickel, has been a major industry in Kalgoorlie ever since, and today employs about one-quarter of Kalgoorlie’s workforce and generates a significant proportion of its income. The concentrated area of large gold mines surrounding the original Hannan find is often referred to as the Golden Mile, and is considered by some to be the richest square mile of earth on the planet. Kalgoorlie’s main mine, known as The Super Pit is an enormous open-cut gold mine approximately 3.6 Kms (2.2 mi) long, 1.6 Kms (1.0 mi) wide and 512 metres (1,680 ft) deep. Occasionally the excavation has revealed an old shaft containing abandoned equipment and vehicles from the earlier mines. The mine operates 24 hours a day, 7 days a week, and a visitor centre overlooks it. The mine blasts at 1:00 pm every day, unless winds would carry dust over the town. Each of the massive trucks carries 225 tonnes of rock and the round trip takes about 35 minutes, most of that time being the slow uphill haul. Employees must live in Kalgoorlie; it is not a fly-in fly-out operation. The mine is expected to be productive until about 2029.